It’s a cliche: In real estate, you make your money on the buy. The deal needs to be right from the beginning, or you’re sowing the seeds of disaster. There’s no longer any reason to be intimidated by a negotiation. It’s science and art. Learn the science so negotiation is demystified. Then with some practice, you’ll master the art. Learn at your own pace and use the manual as Quick Reference anytime you need an answer fast! Learn how to successfully convert leads into sellers that say YES to your offer! How to effectively negotiate the best deal each and every time! How to negotiate from a position of power each and every time! How to get people to “Like You, Trust You, and Want to do Business with You” no matter what the situation! How to conduct phone call and face-to-face meetings with sellers better than anyone else! 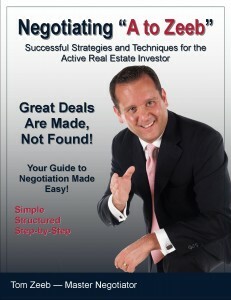 More than 35 powerful negotiation tactics!